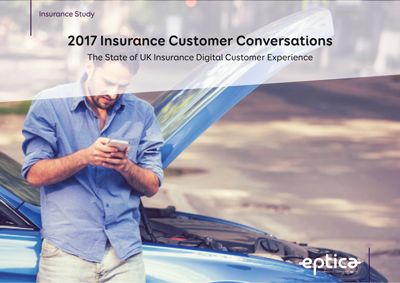 Study: Customer Conversations - The State of UK Insurance Digital Customer Experience | Eptica - Multi Channel Customer Interaction Software. Email Management. Web Self-service. Live Chat and Agent Knowledgebase. 91% of consumers say good digital customer service from insurers makes them more loyal – yet the UK’s leading insurance companies fail to accurately answer more than two thirds (68%) of routine questions asked through the web, email, Twitter and Facebook. In 2016 the figure was 47%, showing a dramatic decline in performance over the last 12 months. No wonder that just 15% of consumers are happier with the insurance customer experience compared to 5 years ago. Building on research carried out since 2011, the Study surveyed 20 home and car insurers by analysing their responses to routine questions asked via the web, email, social media and chat, looking at criteria including speed, relevance, context, personalisation and empathy. The study also surveyed 1,000 consumers to find out if their customer experience needs are being met by insurers. We invite you to download your copy of the study which includes the full findings of how the Insurance sector performed, along with recommendations to improve and address the key challenges of CX. Please take a few moments to fill the information below.